Medication errors can lead to inappropriate use or harm, and can occur anywhere along the prescribing continuum. The pharmacist can play an important role in evaluating and reporting errors, and developing quality-improvement programmes , this can reduce the number of medication errors. A medication error is defined as any preventable event that may cause or lead to inappropriate medication use or patient harm while the medication is in the control of the healthcare professional, patient, or consumer . Such events may be related to professional practice, healthcare products, procedures, and systems. They include prescribing, order communication, product labelling, packaging, nomenclature, compounding, dispensing, distribution, administration, education, monitoring, and use. Cancer drugs are involved in 15.4% of reported fatal cases . High-risk drugs have serious consequences, including death; however, medication errors made in prescription preparation and administration also have serious consequences. In addition to chemotherapy drugs, people with cancer receive multiple drugs that predispose them to many drug–drug interactions and adverse drug events . Even though clinical pharmacists are actively involved in patient care, many of their efforts remain undocumented, resulting in an underestimation of the importance of their services and missed opportunities for improvements and new directions . Medication errors can occur at any time, from the initial prescription order to the final consumption of the drug by the patient. Reports of medication errors and interventions should be evaluated and incorporated into a continuous quality improvement programme. The pharmacist must assume responsibility for developing and implementing a plan, and preventing medication errors through detection and evaluation. The aim of drug treatments is to achieve defined therapeutic outcomes that improve a patient’s quality of life while minimising risk. Around one in 10 hospital prescriptions, however, contain an error. Research has found that these errors can be minor or potentially lethal. A UK study commissioned by the General Medical Council in 2009 found that few errors would have caused serious harm . A total of 124,260 prescriptions were checked by pharmacists in 19 hospitals in England, 11,077 (around 9%) errors were detected. The mistakes included omitting drugs, incorrect doses, patient allergies not taken into account, illegible handwriting, or ambiguous orders. It is not known how many errors were not picked up by the pharmacist, and so the figures are at the lower end. When doctors were interviewed about their mistakes, some admitted that they relied on the pharmacist to correct them. Of these 11,077 errors were intercepted and corrected before reaching the patient, about 2% contained potentially lethal instructions, e.g. failing to account for a patient’s allergies. According to CHKS, the UK’s leading independent provider of healthcare intelligence and quality-improvement services, patient drug allergies have recently been added to the prescription form. The doctor has to indicate on the form one of the following: whether the patient has an allergy; the name of the medication; if they do not have an allergy; or whether it is unknown whether or not they have an allergy. Not all doctors complete the allergy section on the prescription form. The General Medical Council found that newly qualified doctors were twice more likely to commit a prescribing error than a consultant. Contrary to belief, more recently qualified doctors were no more responsible for perpetrating errors than experienced doctors. Doctors in their first year of medical training, however, made slightly fewer mistakes than average, although the error rate rose slightly in their second year; consultants, however, made the fewest mistakes. The General Medical Council has called for the establishment of a UK-wide prescription chart to reduce errors. Few of these mistakes were found to cause actual harm to the patient, because the errors were intercepted by senior doctors, nurses and, in particular, pharmacists. Concerns were raised that some doctors relied too heavily on this safety net for picking up errors. Opinion polls consistently show that pharmacists are one of the most trusted professionals—coming a close second to fire fighters (poll for the Readers Digest) . Pharmacists are experts in medicines and have more in-depth knowledge about them than any other healthcare professional. The increased complexity of medicines, and the huge potential for medicines to interact with each other, makes prescribing more difficult. It is estimated that 5% of all hospital admissions are the result of adverse effects of medicines . All of this means that doctors need support from pharmacists to help them improve prescribing, and patients need support to better understand and benefit from their medicines. In hospitals, pharmacists are already an integral part of the clinical team, and advise on complex medicine regimens. Most prescribing, however, is started in the community, and it is here that pharmacists could play an important role in optimising therapy and avoiding adverse effects. We conducted a study at the Bank of Cyprus Oncology Centre, a tertiary cancer centre. The aim of the study was to describe, evaluate and document the prevention of medication errors by clinical pharmacy interventions in people with cancer. We evaluated interventions made by pharmacists during their daily routine practice in the chemotherapy-dispensing pharmacy and outpatient dispensary, and during ward visits by clinical pharmacists. All medication errors detected by pharmacists were reported according to our departmental pharmacy procedure. Only the reported interventions that occurred between February and May 2012 were reviewed and analysed accordingly. A documentation template was designed to collect the following information: patient data, supportive care issues, drug-specific interventions, and prescriptions written. Pharmacy interventions included detecting medication errors in the outpatient dispensary, detecting chemotherapy errors during the verification of the prescribed chemotherapy regimen, and detecting inpatient errors during clinical pharmacist visits on the ward. The interventions were made by seven pharmacists—two clinical pharmacists on the ward and five pharmacists in chemotherapy and outpatient pharmacy. Not all pharmacists reported the same number of interventions. 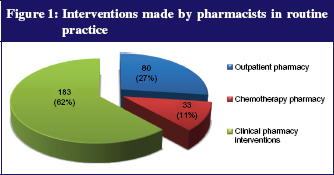 In total, 296 interventions were made by pharmacists. 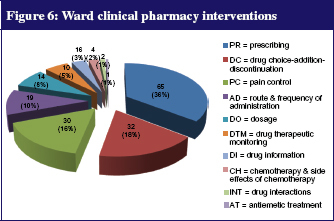 From these, 183 (62%) were clinical pharmacy interventions on the ward, 80 (27%) were pharmacy interventions in the outpatient pharmacy, and 33 (11%) were interventions in the chemotherapy pharmacy, see Figure 1. Pharmacists are rightly paranoid about accuracy because the consequences of an error could be serious. Most dispensing involves picking the right pack of medicines off the shelf and putting the right instructions on it. It is a manual task crying out for some form of automation. It involves manually entering information from a prescription into the pharmacy computer so that a label can be generated for the medicine. An electronic prescription could be automatically transferred from the doctor directly into the pharmacist’s computer like e-mail, and could be used to automatically generate a label. Like most projects, the electronic prescription service is depressingly slow to deliver . Supermarkets revolutionised check out throughput and accuracy with the use of bar-code scanners. But pharmacists cannot use them in dispensing because no industry standard bar-code system is in use across all manufacturers. Between one-quarter and one-third of all prescriptions require strips of tablets to be cut, because the quantity on the prescription does not match the pack size. In most cases, if felt appropriate, the pharmacist will round up or round down the quantity to the nearest pack size for patients on long-term medication; it would make no difference. At the Bank of Cyprus Oncology Centre, we dispense around 180 prescriptions and around 12 opioid prescriptions a day. A total 3,772 outpatient prescriptions were dispensed during the period February to May 2012. 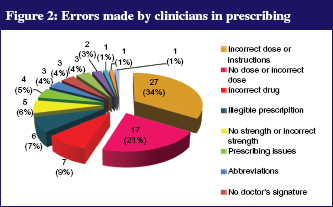 During that period, 80 (2.12%) pharmacy interventions were reported by pharmacists as a result of detecting a medication error on the prescription, see Figure 2. Not all interventions were reported by pharmacists. Twenty-seven (34%) prescriptions involved errors in which no dose or an incorrect dose or instructions were prescribed; in 17 prescriptions (21%), the patient’s name or registration number was missing from the prescription. Seven (9%) prescriptions contained an incorrect medication, e.g. tamoxifen instead of anastrozole. These errors were identified by pharmacists through patient medication history available on our custom-made pharmacy software. Other errors on prescriptions included illegible writing, ambiguous wording, or use of abbreviations, e.g. TMZ, TMX, and HCTZ. In all cases, the pharmacist contacted the doctor who made the correction on the prescription. Although only two interventions were reported by pharmacists for narcotic prescriptions during the above period, more errors were identified after a random retrospective analysis of 200 prescriptions. According to Cyprus legislation, all prescriptions must be in the prescriber’s own handwriting and include the patient’s name, registration number, strength and form, total quantity of dose units written in words and figures, the dose to be taken by the patient, the prescriber’s signature, and date. In 100 out of 200 (50%) of the prescriptions, only the signature of the doctor was on the prescription, which was difficult to decipher; 58 out of 200 (29%) of the prescriptions had both signature and the name of the doctor; and 42 out of 200 (21%) of the prescriptions had both stamp and doctor’s signature, see Figure 3. The prescribing of immediate-release morphine was checked in 200 opioid prescriptions. 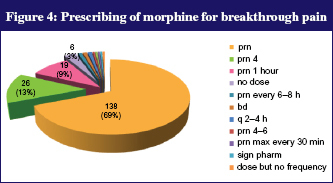 In 138 (69%) of the prescriptions, an as-needed dose of morphine was prescribed without defining the frequency of administration of morphine; in 26 (13%) the doctor prescribed an as-needed dose of morphine to take up to every 4 hours; in 19 (9%) an as-needed dose of morphine was prescribed to take up to every 1 hour; in 6 (3%) the dose and frequency was not written by the doctor; in two prescriptions the frequency was every 12 hours and; in others, every 2–4 hours, every 4–6 hours, every 30 minutes; and one prescription was for mouthwash use, see Figure 4. From the above results, we assume that not all medication errors were detected or reported by pharmacists. In collaboration with medical oncologists, clinical pharmacists are responsible for developing and amending all pre-printed chemotherapy prescriptions. We have a pharmacy department adjacent to our clean room. The pharmacists check all written chemotherapy prescriptions and ensure that the appropriate time between treatment cycles has lapsed, appropriate antiemetics are prescribed, and specific toxicity-limiting steps are prescribed. Drug doses are calculated correctly according to body surface area. Then, the pharmacist defines the final dose by adjusting the dose up to 5% according to the quantity of drug in vials, thus making cost savings. Appropriate diluents and volume for reconstitution of powder forms and drug volumes are calculated, and the pharmacist signs the prescription. A total of 1,063 chemotherapy protocols were checked and doses dispensed accordingly during the above period. Thirty-three (3.1%) interventions were reported, which is less than expected. 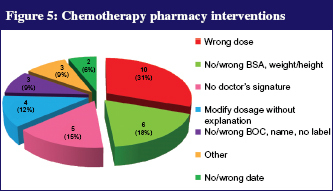 An incorrect dose was prescribed in 10 (31%) protocols; in other cases, chemotherapy was prescribed for a non-intended patient; a doctor’s signature was missing; patient data, such as name, registration number, body surface area, weight or height, were either incorrect or missing, see Figure 5. In some cases, the dose was modified without any explanation, e.g. liver failure. All interventions were accepted and corrected by the doctors . In one case, epirubicin instead of doxorubicin was administered to one patient, despite all checks taking place, e.g. doctor, pharmacist, nurse. An important distinction is needed when drugs that sound alike, e.g. doxorubicin and epirubicin are used for the same tumour types, and may be given to patients sitting next to each other in a busy infusion centre, but have significantly different dosing regimens and toxicity profiles . Additionally, a decimal point can be missed if the prescriber fails to round doses of more than 5 mg or 10 mg to the nearest whole number, which can potentially cause a 10-fold overdose. Similarly, the unwise use of a ‘trailing zero’ or ‘leading decimal’ also has the potential to cause a 10-fold dosage error . Computer systems may be the best prevention for medication errors; however, most oncologists still hand write orders, often because commercially available software simply is not available . When it is available, it is often poorly written, incompatible with existing computer systems, or otherwise unreliable. As a result, other safety steps remain valid . Clinical pharmacists participate in ward rounds at the Bank of Cyprus Oncology Centre. They are members of the multi-professional team for supportive care of the hospital and the pharmacy and therapeutics committee. During patient visits, supportive care issues were addressed, including pain management, constipation and diarrhoea, and nausea and vomiting. Major drug-specific interventions included drug addiction and discontinuation, and dose adjustment. On the ward, clinical pharmacists reviewed the patient’s treatment charts and conducted patient interviews to obtain medication history. Identified drug-related problems were discussed with doctors, and appropriate interventions were made. Patient outcomes were evaluated by patient interviews on the following clinic visit or by follow-up telephone calls. All interventions were documented in pharmacy-documentation forms. Most interventions were unrelated to chemotherapy. The most frequent activity was patient counselling, followed by therapeutic recommendations after discussion and acceptance by the doctor. Most frequent interventions included pain control, drug addiction or discontinuation, dosage modification, and prescribing issues, see Figure 6. Other interventions included drug interactions, route and frequency of administration, therapeutic drug monitoring, extravasation, antiemetic treatment, and drug information. Problems in prescribing [65 (36%)] documented on drug-therapy sheets, included use of drug abbreviations, prescription of drugs with their trade instead of generic name, drug prescriptions by junior doctors that needed authorisation from consultants, incorrect route of administration, doses written in milligram (mg) instead of microgram (mcg), administration of a non-prescribed drug and incorrect drug formulation. Clinical pharmacists participate in pain management and palliative care. They discuss and recommend advanced analgesic administration methods, alternative drugs, and also help doctors with opioid conversion calculations. Many patients must switch from one opioid to another or from one route of administration to another as they approach the end of life, owing to either poorly controlled pain or the development of adverse effects. The management of adverse effects is a critical part of good pain management, and includes anticipating and preventing adverse effects. On the ward, clinical pharmacists recognise the importance of educating patients and caregivers about the therapeutic goal, analgesic regimen, and the management of adverse effects. Recommendations on pain management [30 (16%)] included increasing or decreasing the dose of opioids and changing medication, e.g. from morphine to oxycodone, oxycodone to fentanyl. Furthermore, clinical pharmacists check all prescribed doses and conversions of opioids, and ensure that laxatives and hourly as-needed dose for morphine is prescribed for breakthrough pain. Patients were encouraged to ask for their breakthrough dose of morphine when in pain up to every hour. As-needed doses should not be given more often than hourly without medical review. As pain has associated spiritual and psychosocial symptoms, clinical pharmacists referred patients to the spiritual priest and psychologist, who are members of our multi-professional team. A pain diary and a pain scale were given to some patients to monitor pain levels, medication requirements, the effectiveness of analgesia, and any side effects. The effectiveness of a pain diary will be evaluated and introduced after the approval of the Pharmacy and Therapeutics Committee of the Centre. Clinical pharmacists will further contribute to the development of pain guidelines in the near future. Clinical pharmacists reviewed medications through the use of a medication chart, and recommended discontinuation of the medication that was no longer indicated, e.g. azithromycin, ondansetron, lactulose, senna, metoclopramide. The recommendations were accepted by doctors. A new medication was added in some cases, e.g. omeprazole. Interventions were also made for the route of administration (oral or IV) and the time of day the drug was due to be administered. Proposals were made for dose reduction owing to a drug-related side effect or interaction. Appropriate dosing adjustment was recommended according to drug levels of drugs with narrow therapeutic index, such as vancomycin, gentamycin, carbamazepine, digoxin and phenytoin. Information was given to medical staff about specific side effects of chemotherapy, extravasation, handling of oral chemotherapy drugs, management of rash from cetuximab, and management of vomiting in specific cases. Information was also provided about the prescribed dose of medications, such as prochlorperazine, lorazepam, and ranitidine. Also, information was provided to nursing staff about the reconstitution, storage and administration of medicines. Pharmacy interventions among people with cancer can reduce the number of medication errors. All staff need to be encouraged to report medication errors . The goal is not to blame a person but to improve the healthcare system, to reduce medication errors, and to improve the patients’ quality of life. Strong evidence shows that, when appropriate education training is delivered, prescribing improves . Procedures should be as simple as possible, to minimise the chance of an error being made. Clinical pharmacists have a significant role to play in the management of people with cancer, and should be members of multi-professional teams of each hospital. Pharmacy input can lead to a decrease in healthcare costs and to an improvement of the quality of patient care . Interaction with the healthcare team in patient rounds, identification of drug-related problems, and provision of information to patients and clinicians, can result in an improved outcome for the patient and hospital. 1. Dennis S O’Leary, Accreditation’s role in reducing medical errors. West J Med. 2000 June; 172(6):357-8. 2. Patel I, Balkrishnan R. Medication error management around the globe: an overview. Indian J Pharm Sci. 2010 Sep-Oct;72(5):539-45. 3. Knez L, Laaksonen R, Duggan C. Evaluation of clinical interventions made by pharmacists in chemotherapy preparation. Radiol Oncol. 2010;44(4):249-56. 5. Shah S, Dowell J, Greene S. Evaluation of clinical pharmacy services in a hematology/oncology outpatient setting. Ann Pharmacother. 2006;40(9):1527-33. 8. Nicholas M, et al. Frequency and cost of serious adverse drug reactions in a department of general medicine. Br J Clin Pharmacol. 1998 March;45(3):301-8. 9. Hughes CF. Medication errors in hospitals: what can be done? Med J Aust. 2008;188(5):267-8. 10. Barber N, Batty R, Ridout DA. Predicting the rate of physician-accepted interventions by hospital pharmacists in the United Kingdom. Am J Health Syst Pharm. 1997;54(4):397-405. 11. Schulmeister L. Look-alike, sound-alike oncology medications. Clin J Oncol Nurs. 2006 Feb;10(1):35-41. 13. Dwight D, Kloth, PharmD, Director of Pharmacy Fox Chase Cancer Centre, Philadelpia, Pensylvania. Guide to the prevention of chemotherapy medication errors, 2nd edition [monograph on the Internet]. New York: McMahon Publishing; 2010. 15. Schwappach DL, Wernli M. Medication errors in chemotherapy: incidence, types and involvement of patients in prevention. A review of the literature. Eur J Cancer Care (Engl). 2010;19(3):285-92. 16. Nichols P, Copeland TS, Craib IA, et al. Learning from error: identifying contributory causes of medication errors in an Australian hospital. Med J Aust. 2008;188:276-9. 17. Eadon H. Assessing the quality of ward pharmacists’ interventions. Int J Pharm Pract. 1992;1(3):145-7.